A week late once again, but better late than never! Here are some of our highlights from April. Around here we have been waiting for warmer weather to show up! Instead of April showers, we've been having April snow flurries. Ugh. Around here the boys have been really loving their Kindermusik classes. JJ is constantly singing songs, and Austen is still loving all the attention of being the only kid on the move in class. Around here both boys had a week or so of being out of commission - Austen had a chest infection and JJ had some sort of viral infection. Considering that was really their only sickness all winter, I thought we did pretty well. Around here we took the boys to their first movie in the theatre - Zootopia! Austen did really well, and JJ wasn't really interested at all, and probably watched like 5 minutes of the movie, total. Despite that, it was a really great movie! Around here we celebrated JJ's 4th birthday! He chose to go to the park, and get subs for supper for his special day! (Very high expectations...! Haha!) So hard to believe he is already 4!! He is such a sweet, and loving and caring little guy. Our little sweetheart. Around here JJ has acquired a few new trucks in his fleet. The truck obsession continues. Although he has nights where he hasn't slept with any trucks - a very big deal for him! He has been sleeping with a truck in his bed with him nightly for almost a year! Around here Austen has finally started showing an interest in books and reading. Previous to this his only interest was tearing them apart. Around here Austen has been going through a terrible phase with his carseat. It is absolute torture trying to get him sitting in it, and buckled in. I remember JJ somewhat going through a phase like this, but not nearly as bad. Can't wait for this to be over! Around here we got JJ an "OK to Wake" clock, hoping to get him to sleep in a little longer in the mornings. Both for our benefit, and his. He doesn't nap during the day, and could use a little more sleep in the mornings. How was your April? I'd love for you to share a highlight in the comments! 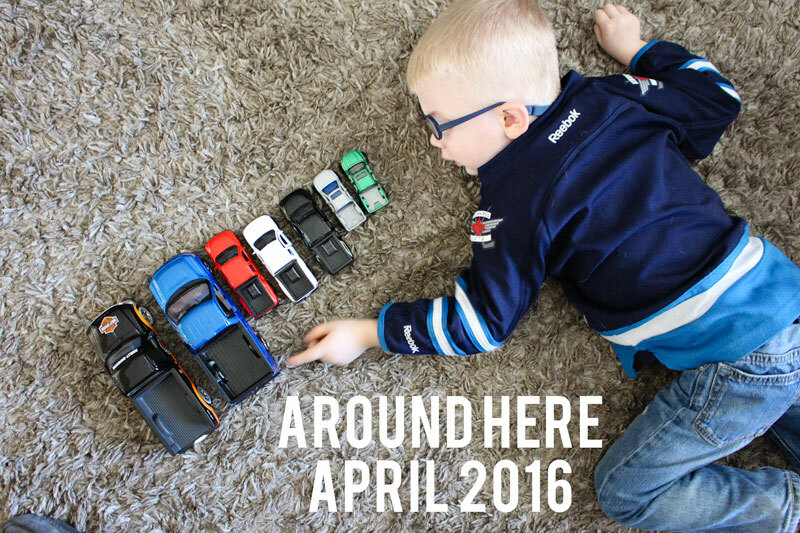 Love that "around here" prompt, Nicole! Making a note to use it in the future!! Have a blessed day!! XO!